[PDF] Computer Systems: A Programmer's Perspective (2nd Edition) | Free eBooks Download - EBOOKEE! Description: Product Description: For Computer Systems, Computer Organization and Architecture courses in CS, EE, and ECE departments. Few students studying computer science or computer engineering will ever have the opportunity to build a computer system. On the other hand, most students will be required to use and program computers on a near daily basis. 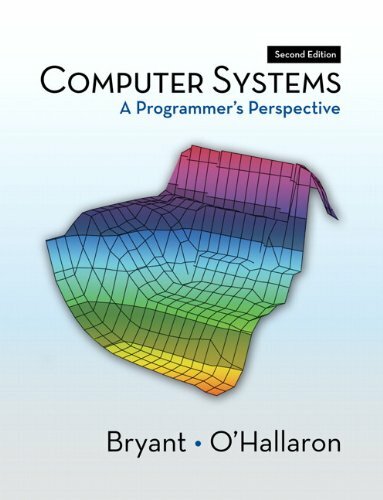 Computer Systems: A Programmerâ€™s Perspective introduces the important and enduring concepts that underlie computer systems by showing how these ideas affect the correctness, performance, and utility of application programs. The text's hands-on approach (including a comprehensive set of labs) helps students understand the â€œunder-the-hoodâ€ operation of a modern computer system and prepares them for future courses in systems topics such as compilers, computer architecture, operating systems, and networking. Visit the CSS:AP web page http://csapp.cs.cmu.edu for more information and resources. No comments for "[PDF] Computer Systems: A Programmer's Perspective (2nd Edition)".